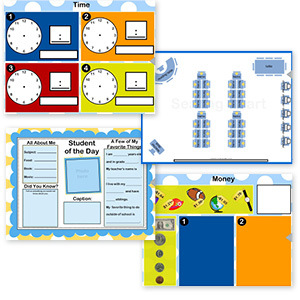 Download our Back to School Content Pack, updated for 2014-2015, featuring such useful templates as calendars, morning meeting activities, attendance charts, seating charts, daily graphing activities, and more. You can choose completed lessons, or select from the many images and templates to easily create your own customized activities and lessons. This Back to School Content Pack can help you to quickly get organized, no matter how you like to create and customize your lessons and resources. Have last year’s Back to School Content Pack? If you downloaded last year’s Content Pack, with 2013-14 calendars, you may want to remove it from your Gallery before you download the new one.